‘Other’ Settings’ section includes a wide variety of settings for your Roommate Website Service. Let’s cover all of them one by one. Limit of listings per private persons: administrator can set a limitation for a number of listings added by members of user type ‘private person’. For example, John Smith, a private person, will not be able to post more than 3 listings. He will get a message with a suggestion to change his status “Private person” into “Real Estate Company” or “Agent of Real Estate Company”. Once status is changed, the limitation becomes inactive. Paths of file loads: this section displays the paths where user uploads are stored and design template folders and files located. 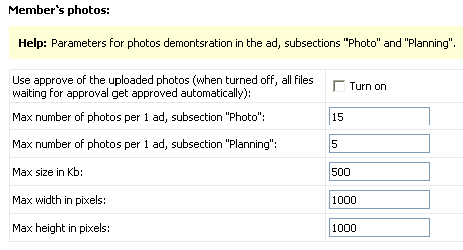 Change these settings in case you integrate a different template or you would like to change folder for uploads. Members’ photos: section where administrator manages settings for uploaded photos. Members’ video files: section where administrator manages settings for uploaded videos. Square measure: used to choose square measure that will be used on the site. 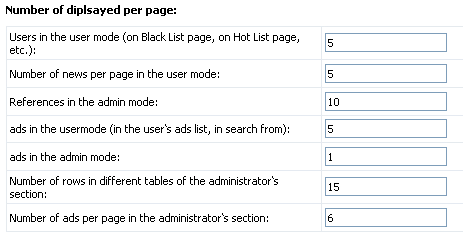 Headline in ads description: allows site administrator to set number of characters allowed to be used in ad headline. Period of ad’s activity: administrator can set a period of ad’s activity here, to do that put a mark to enable the option and enter the period for ad’s activity. Status “Leased“: administrator can enable such status for leased ads on the site. This will result in displaying such ads in search results with a special icon. Registration confirmation – if this feature is enabled, site users will have to confirm their registration clicking the link sent to their email address. This option will help avoid automatic registrations. 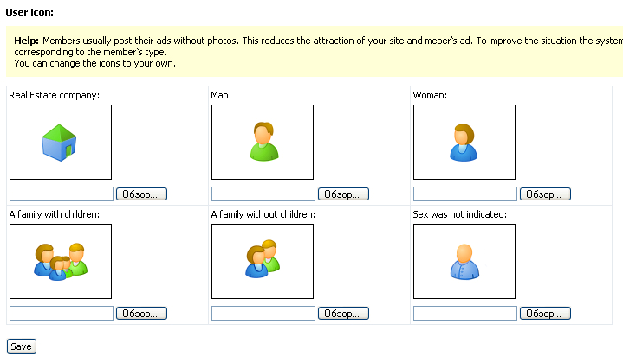 User Icon: the subsection allows site administrator to change default icons which are displayed in case a user does not add his photo or company logo (for Real Estate Company).